Thread: KOMANDIRSKIE lets see them. Re: KOMANDIRSKIE lets see them. New vintage arrival. Unfortunately, when I took it out of the box and turned the watch over, the crystal popped right out! I don't think it's a case of the seller not disclosing the fact, it seems to have loosened in transit because it didn't immediately fall when I turned it over. Am I correct in assuming that I can just glue it back in with epoxy? (if so, what brand/type would you suggest?) The crystal has a pretty deep scratch in it and is the only flaw I can see cosmetically! I might just buy a new one... but should I keep it "original"?! Decisions! P.S I also had a NEW Komandirskie arrive yesterday, but my camera died just after I snapped the above photo, so no pics at the moment. Last edited by theinterchange; March 23rd, 2014 at 23:05.
rocketman 333, starman69, khd and 1 others like this. theinterchange, jurgensonovic, OhDark30 and 2 others like this. Received my second Komandirskie from Amil/Marina today! theinterchange, OhDark30, khd and 4 others like this. Love that black zakaz model, yours has a small problem though, the tail is missing from the seconds hand. On close inspection, there is no break point indicating there ever was a tail... Possibly a different kind of model maybe? I meant the strap... I've seen them around but haven't seen what the wording on the back could mean. 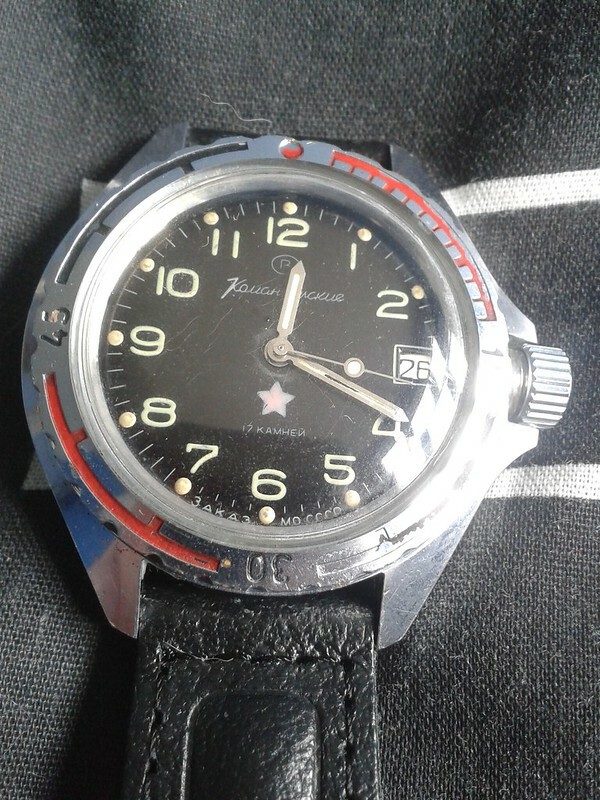 Geniune leather in Cyrillic maybe? I doubt that, the same type of hand was used on most komandirskies and amphibians. Maybe yours was modified because it was damaged. Not too big a deal though, at least to me. I still love it! It's also considerably bigger than my first - which I found mildly surprising. (Though, it was probably pretty obvious it wasn't going to be the same size). Edit: Would you have any idea about the strap? 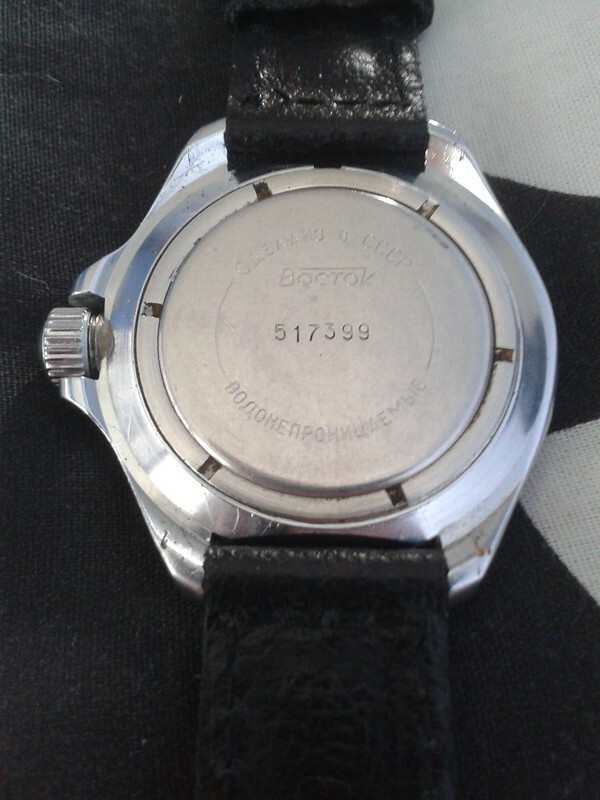 I managed to work out that the side with the buckle has "ВОЛЯ" printed on the underside - which to my knowledge (Google translate) means "Will"...? Last edited by Letchy; March 26th, 2014 at 19:14. I just recieved my first Komandirskie in the post, so it's great to finally be able to post on this thread after enviously reading Letchy's posts! We bought about the same time but I had to wait much longer... as John Cleese said recently, "the only problem with Australia is that there are planets that are closer!" 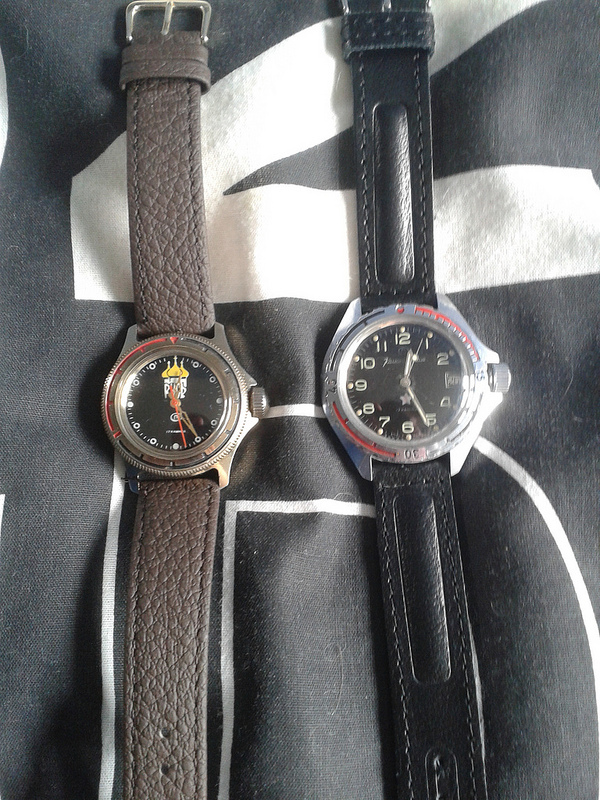 Anyways, this is actually my first Russian watch, and I couldn't be happier... I got it for an absolute song and the condition was much better than I expected, especially compared to the seller's pictures which showed every little blemish in high resolution to ensure buyers were well informed before bidding (by the way I highly recommend Amil, he was a pleasure to deal with). It's kind of hard to see in photos, but the dial has a really nice and very subtle two-tone brown effect, where the outer circle is matt and the inner portion is glossy. I've got a tan leather band in the post, but it also came with a pretty nice black leather band as well which was a nice surprise as it wasnt listed in the ad. I've also found that it is much slimmer and smaller compared to the watch I generally wear on a daily basis (Seiko SKX007), so it fits really nicely under a shirt cuff which is great for the office. I've even been impressed by the accuracy - it is keeping within 20sec of my Seiko each day which is as much as I really need, plus I forgot to wind it one morning but it kept going for well over 48 hours. The only problem is that there is no way I will be able to stop at one... it was just too good value! rocketman 333, sq100, amil and 2 others like this.